Holiday Swagfest 2009: The Epic Coach Bag Giveaway | Fashion. Style. Beauty. | Life is short. Live well. Oh yes, it’s that time of year and I’m feeling really generous. As a matter of fact, I think you deserve a shot at a really nice gift. I’ve given away cosmetics, designer denim and now you lovely subscribers are about to hit the mother lode: I’m giving away a Coach bag. 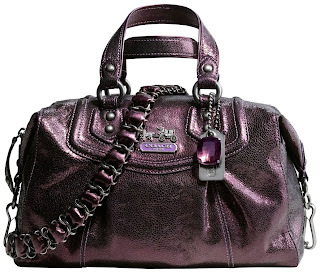 Sitting in my possession as we speak is a fabulous Coach Madison Metallic Audrey Bag, which retails for $598. The bag is in amethyst metallic and I must say, I love it and wouldn’t part with it for anyone but one of you lucky people who will win this fabulous little handbag just in time for the holidays. 3) I will choose one winner at random this coming Friday, December 17th and I will mail the bag out to you on December 18th. No PO Boxes and you must live in the continental Unites States, please. The contest opens right now and I will announce the winner of this giveaway next Friday night. Good luck!